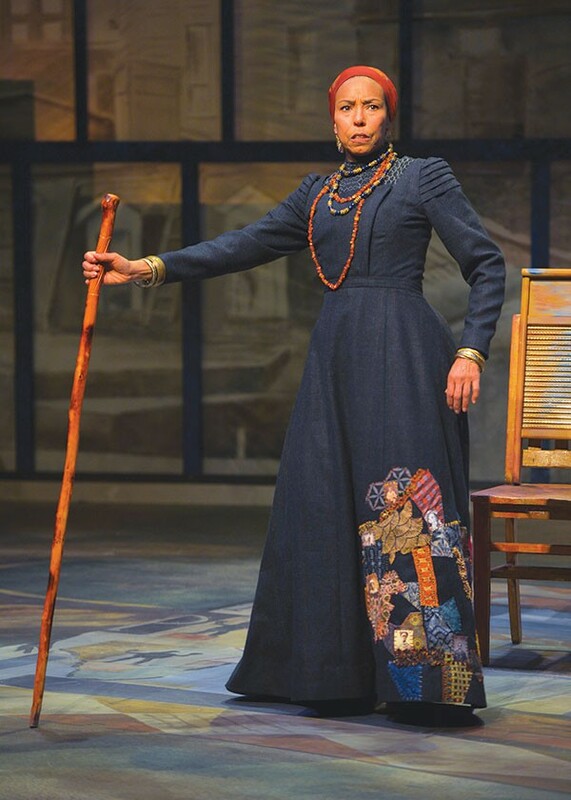 The late August Wilson's penultimate play, the supremely lyrical and gorgeously written 2003 drama Gem of the Ocean, may be set in 1904, but its themes stretch purposefully back in time to the beginning of New World slavery and reach forward to the present, when African Americans are still fighting many of the same struggles. This timelessness is sewn into the script of Gem like the old quilts and collages that Wilson gave as inspiration for his work, blending lush historical detail and remarkably well-drawn characters into a plot that unfolds like a roll of fabric, with language and dialogue that moves from colloquial specificity to the heart-breaking heights of pure poetry. In Daniel Alexander Jones' sometimes baffling but emotionally rich staging, Wilson's engaging words are embellished with a kind of hand-clapping, finger-snapping, sign-language-style choreography that resembles dance but stops short of having his characters actually burst into ballet or the soft shoe. It's a technique Jones calls "theatrical jazz," something the young New York–based director is known for. Whether Wilson's tour de force cries out for such initially distracting ornamentation, or whether the story is served or strengthened by this distinctively, almost ritualistically musical performance, is ultimately beside the point. This is, after all, the most mystical and "ritualistic" of Wilson's 10 Century Cycle plays, and Jones' aesthetic eventually does make a kind of otherworldly sense. There is a lightness and playfulness to the entire production, which makes it stand out from other productions of Gem I've seen, and the sense of determined hopefulness and ragged joy that rises from the story's accumulating tragedies at times feels almost revolutionary. The story follows a group of lost, wounded souls who've found a refuge in the Pittsburgh home of Aunt Ester (played with brilliant, buoyant groundedness by Margo Hall), who claims to be 285 years old, and serves as the personification of her community's collective memory of slavery. Throughout the two-and-a-half-hour play, Ester ushers a guilt-ridden newcomer named Citizen Barlow (Namir Smallwood) through initiations that include a guided visualization to a city of bones at the bottom of the sea. Though there are challenges in this bold, impeccably acted reinterpretation of an American masterpiece, the audience goes along with Barlow on a similar journey, one that is as mysterious and strange as it is illuminating, devastating and beautiful. 'Gem of the Ocean' runs Tuesday–Sunday through Feb. 14 at Marin Theatre Company. 397 Miller Ave., Mill Valley. Times vary. $20–$58. 415.388.5208.